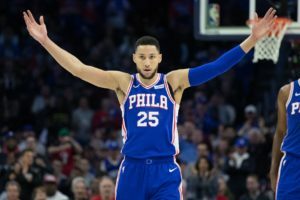 Kevin and Russ break down the Sixers loss to the Celtics, the positives from the Nuggets and Lakers games, the Brett Brown debate, Aaron Nola’s extension, prepping for the Stadium Series Flyers v. Penguins, what the Joe Flacco trade means for the Nick Foles market, and plenty more! Kevin and Russ dissect the Sixers’ trade for Tobias Harris, Boban Marjanovic, and Mike Scott. The guys then recap the “secret meeting” between six Eagles reporters and Carson Wentz, the Phillies’ interest in JT Realmuto, Mike Missanelli’s hockey take, and the Union’s rumored target. The Union are Being Linked to…. a Really Good Player? I constantly rip the Union for performing like a small market team. He’s really good, a 29-year-old attacking midfielder and Mexican international currently playing for Eintracht Frankfurt in Germany. He’s been limited recently due to a back issue and really has not played much. The Union are gonna have to do their due diligence here, and if they get it right they’re bringing in a guy who finished the 2016-17 season with seven goals and four assists. He has 72 goals and 46 assists in 317 career games with Frankfurt, Cruz Azul, and Chivas de Guadalajara, plus nine goals in 42 appearances for Mexico. Fabian can play wide, but he’s primarily a central attacking midfielder (CAM) and would be used in that position here in Philadelphia. The Union are in their first preseason under new Sporting Director Ernst Tanner, and they ran out what appeared to be a 4-4-2 diamond against Red Bull last week, just judging by the lineup graphic and the names listed. Kevin and Russ break down the Carson Wentz report, vetting sources, Mike Conley’s fit with the Sixers, Roy Halladay’s Hall of Fame induction, the NFL’s overtime rule, Claude Giroux’s all-star week, and Ernst Tanner’s view on the U-20 World Cup. Union training camp opened today at the bubble over on the Penn campus. They train inside for a week then peace out to Florida, where they can actually get out on the grass and run around on a natural surface. They’ll do exhibition games and whatnot. It’s very similar to Phillies Spring Training. Yomi Scintu is the only “mystery trialist” on the list. He’s a young forward from the German FOURTH division. I hope he’s a Bethlehem Steel target, because otherwise there’s no justification for bringing in a fourth division player to compete for an MLS roster spot. I’ll update if Jim Curtin talks about him. Aurelien Collin is an experienced, veteran center back. You’re going to need depth for when Mark McKenzie leaves for the U20 World Cup in the summer, so he doubles as a mentor and 4th CB behind your young core. Carlos Miguel Coronel was in the Red Bull Salzburg system, where Union Sporting Director Ernst Tanner came from. I’m personally not a fan of bringing foreign goalkeepers into MLS, since we usually do a very good job of producing our own domestic talent at this position. Brenden Aaronson has some chops. I’m interested to see how he performs in the midfield this preseason and how his skill set overlaps or doesn’t with fellow homegrown Anthony Fontana. Sergio Santos is really the only name on the list that excites me. The Union paid $500,000 to get him from Audax Italiano in the Chilean first division. He’s 24 years old, a left footed forward who can play up top or as a winger. David Accam needs to have a strong rebound year. Apparently he was off to the side today, still working to recover from the sports hernia that hampered him last year. I would not have brought back Ray Gaddis and Fabinho, but the Union need fullback depth and will also be losing Matt Real to international duty. Olivier Mbaizo should be the opening day starter at right fullback. I did not agree with the Keegan Rosenberry trade. That’s about it. Tanner alluded to more signings soon, and they usually will come in late January and early February. 24-year-old Brazilian Sergio Santos comes to us from Audax Italiano in the Chilean League. He’s swapping Chile for Chester. The rumor popped up a few weeks ago on Twitter, with Santos apparently breaking the news on a radio station down there. He also had interest from Mexican side Necaxa but preferred to play in MLS. I don’t know much about the guy. He scored ten goals for Audax across all competitions last season and Transfermarkt has him listed as a left-footed center forward who can also play as a left winger and second striker. Santos boasts speed and strength, and it’s the directness of his game that should prove to be a good fit in the Union’s transition-oriented system next year. The 181 pound Brazilian is a mismatch for fullbacks with his size, and he presents huge problems for center backs with his speed. In short, he has shown the kind of raw ability that can make him a versatile option up front for the Union as they seek to flexibly adapt their tactics throughout the 2019 season. 6’0″, 181 is pretty solid. That’s the type of build for a tweener forward who can play up top but also do some damage on the wing or play in a pressing system. Houston’s Alberth Elis I think is a good comparison in the size and weight department.